The following post was written by Evan Barrientos, of our two Hubbard Fellows for this year. Evan is a talented writer and photographer, and if you enjoy this post, I encourage you to check out his personal blog as well. …For the record, I did not in any way encourage Evan to photograph or write about crab spiders. This is despite my well-known affinity for them and my personal inability to walk past one without taking its portrait. Over this summer I’ve tried to focus on photographing the prairies with a wide angle in order to show what the landscape looks like, but sometimes it’s just impossible to resist delving into the tiny details and dramas of prairie microfauna. 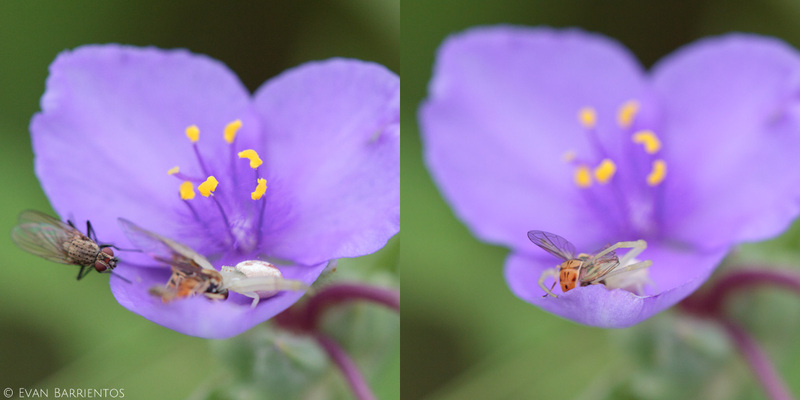 One morning in June I was admiring the spiderwort flowers when I stopped to photograph a crab spider (Thomisidae sp.) sucking the juices out of a hoverfly (Syrphidae sp.) that she had caught. 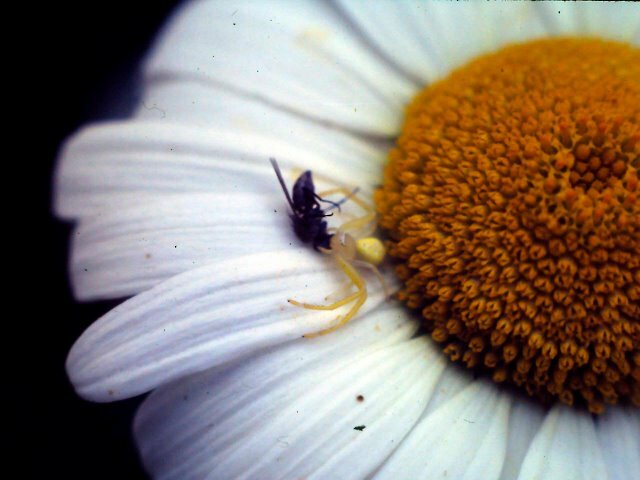 If you’ve been reading this blog for a while, you’ll know that many crab spiders hide on flowers and ambush insects as they stop for a drink of nectar (similar to ambush bugs). Some crab spiders can even change their color to yellow or white in order to match the flower they are on, but this spider didn’t seem to need that trick. To my great surprise, a second hoverfly was brave, hungry, or stupid enough to land on the same flower while I was taking photos. Maybe it thought the spider would be content with the hoverfly already in her fangs. It was wrong. Apparently, this hoverfly liked adrenaline, because it continued to gorge itself on delicious spiderwort nectar for a few more moments and eventually flew off to safety. Thinking the spectacle had ended, I started to pack up my camera gear, but before I could, another fly landed on the flower! As you can see from the photo sequence, the spider was once again too slow to catch the visitor. I watched her for a little longer, but eventually left to photograph a bird singing nearby. I came back a few minutes later to check on the spider and found yet another surprise. In the five minutes I was away, the crab spider had finished eating the first hoverfly and caught another one. 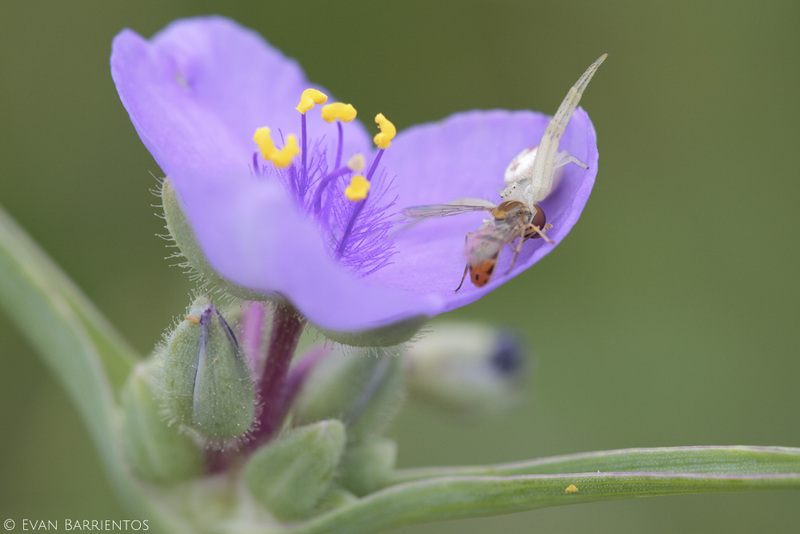 I don’t know if spiderworts are irresistible to flies, or if hoverflies are terrible at spotting white crab spiders on purple flowers, but this spider sure was lucky that morning! Encounters like this remind me how important it is to pause every once in a while and notice the little details. When I do this I’m often amazed by how much is going on around me and how much I would have missed it if I hadn’t stopped. Wide-angle views certainly have their place too, but to fall in love with prairies you really need to stick your nose in them at times. 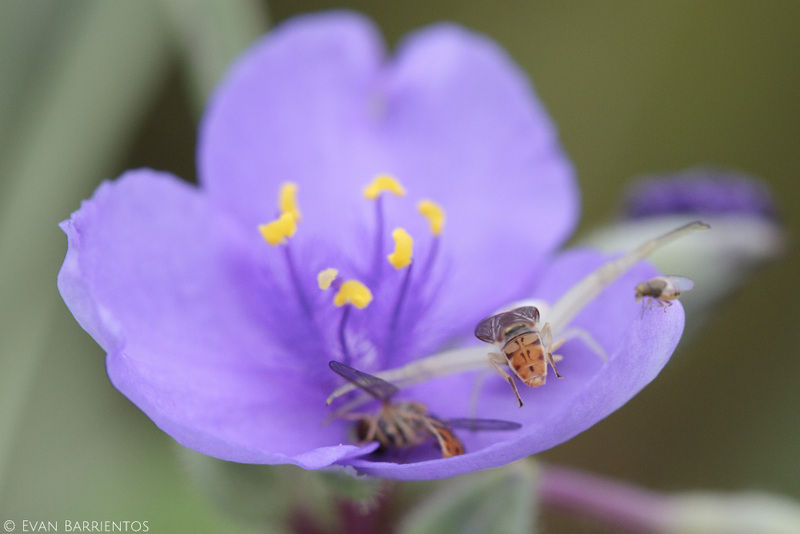 This entry was posted in Hubbard Fellowship, Prairie Insects, Prairie Natural History, Prairie Photography and tagged crab spider, Hoverfly, spiderwort, Syrphidae, Thomisidae, Tradescantia by Evan Barrientos. Bookmark the permalink. This is why I love macro photography. There’s this incredible world going on around us that most don’t pay attention to. I love photographing spiders, ants, grasshoppers, etc while walking through our prairies. Nice job! I guess even having the wrong camouflage color didn’t affect this spider’s success. 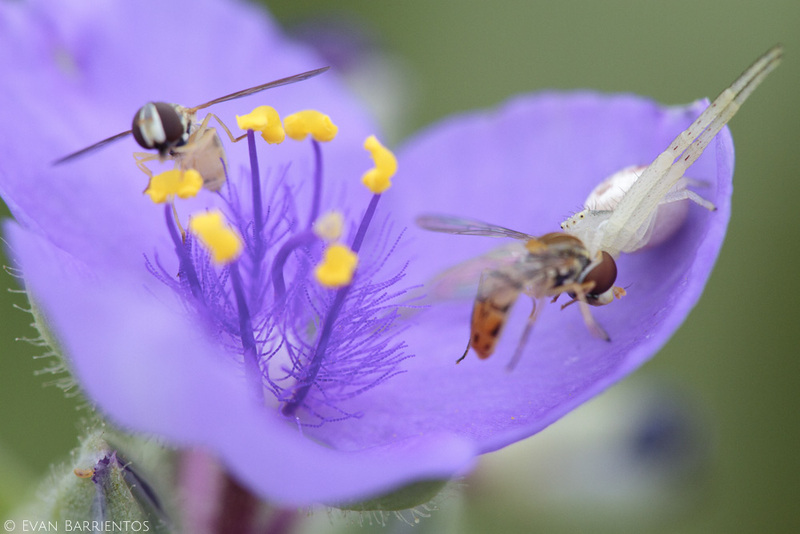 I don’t believe spiderworts have nectar, so the flies must be lapping up pollen grains. Pause to notice the little details”… sage advise! Thanks much.